What seemed like just another day out surfing turned into an unforgettable experience at the beach for a couple of lucky surfers. 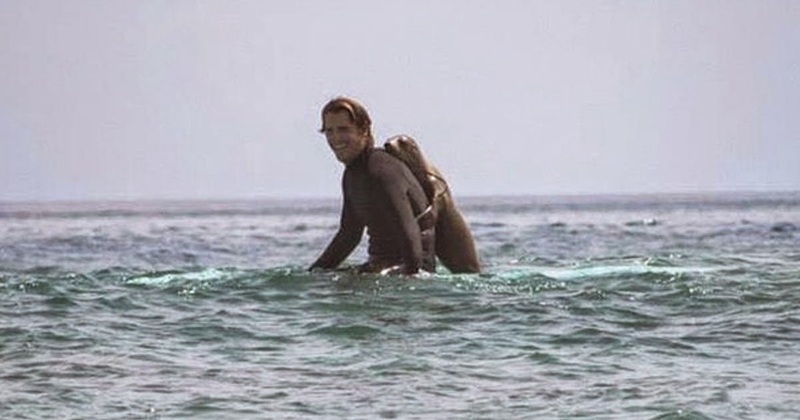 While out catching some waves they had an adorable run in with a young sea lion. However, at first the surfer felt movement in the water behind him and feared a possible shark attack. He was relieved when it turned out to be a baby seal and shocked at this sudden guest. Sea lions are a common sight near the shore and surfers are used to them, but rarely does one get so close, let alone hop onto a board! So when the surfer saw it was a young friendly pup he immediately relaxed and went with the flow. This year it has been widely reported that there has been an increase in the number of sick, ailing, and starving seals and sea lions. Animal experts are unsure what the precise cause of it is. There are various animal rescue and rehabilitation groups aiding wildlife officials and sick animals, all of which can use any help they can get. Please consider donating contributions, volunteering time, or other needed resources, and help get these wonderful creatures back to peak condition.